Orlandos All-Suite Hotel is only minutes from the new Disney Springs entertainment complex and the closest Staybridge to Walt Disney World . Centrally located near the Walt Disney World Theme Parks, Disney Springs and the ESPN Wide World of Sports Complex, the Staybridge Suites Orlando / Lake Buena Vista hotel places guests right in the middle of all the excitement. 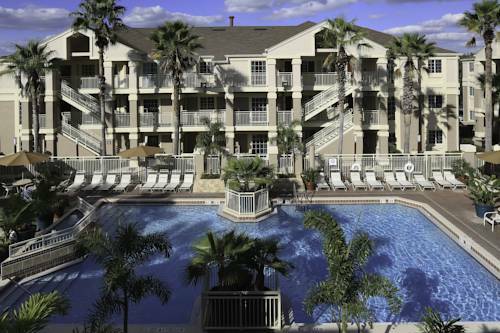 Especially convenient to the Walt Disney World Theme Parks, this family friendly hotel in Orlando, FL is near the Magic Kingdom Park, Epcot , Disney's Hollywood Studios and Disney's Animal Kingdom Theme Park. We offer free shuttle service to all four parks while other Orlando attractions are just a short drive away! Enjoy the Social evening reception each Monday - Wednesday. Meet and mingle over complimentary drinks and light snacks. All guests appreciate our free Wi-Fi and 24-hour Business Center to help keep in touch during their visit. Many restaurants are within walking distance. Wake up to a complimentary, hot breakfast buffet offered daily, or take a relaxing evening stroll through the tropical, landscaped gazebo area.Spacious one and two-bedroom suites with a fully-equipped kitchen help you feel at home during your stay. Other guest amenities include a fitness room, heated pool, and The Pantry open 24-hours with sundries. Our friendly staff in Orlando will help to plan a memorable vacation! full meeting area is 47ft x 19ft. the room can be split in half by a partition giving 2 spaces 0f 23.5ft x 19ft each. Full capacity is 60 people. Outlet Shopping within 2 miles of the hotel. All Name brands, ex. Nike, Reebok, Vanity Fair, and more! Brand name outlets with food court and restaraunts. 180 stores. Walt Disney World Resort includes Magic Kingdom, EPCOT, Hollywood Studios and Animal Kingdom Theme Parks. Blizzard Beach and Typhoo Lagoon Water Parks as well as Downtown Disney Shopping, Dining & Entertainment area. One of a kind journey to the wonders that exist beyond the oceans floor. This theme park will bring you closer to the sea life so you can learn about all of the wonders. If Roller Coasters are your thrill then this is the place to visit. Also remember you can see the Harry Potter Exhibit as well, come prepared to see a land of wizards full of spells. Experience the magic of being a princess to being a child again. There is something for everyone here to enjoy. Experience what tomorrow has to bring and see what we did years ago. You will also be able to visit the Showcase of Countries and sample the food. Take a visit back in time to see how film was done and see how customs are taken care of today. There is a back stage tour that will get you in the middle of a special event. Visit us here to see what specials we have and try some of the best food in Orlando. There is something here for everyone from live music in front of the shops to a Hot Air Ballon ride.